As I wrote before, No Size got out. If you have not been out before, the big guy on the left with the curling horns, is No Size. He is getting rather fat, so he does not need to be out. When the feed wagon goes out, he is right in the middle. He is not shoving any of the rest away, so I figured he has earned some freedom. 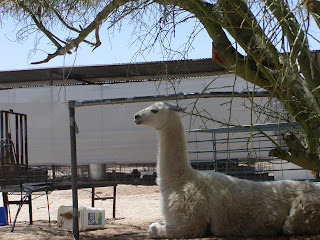 I was out milking this morning and got hot, so I turned on the misters that Marc put out for the alpacas. Emmy has discovered the mister, while the alpacas are sitting in a depression that I have filled with water. 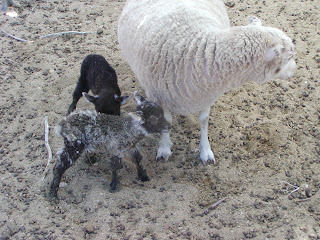 Without a big "to do" Spots had twin ewes this afternoon. Both are up and eating. This is the first time that she has given me a brown lamb. 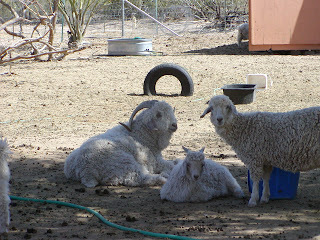 Shetland color genetics are really random. 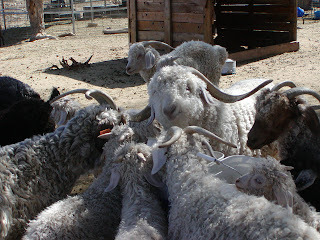 She has also usually had rams. A nice change, since it means I can keep them. They will not be bred this year, since they are born so late.